BUYSOUNDTRAX Records present the premiere release of the soundtrack for FRANKENSTEIN UNBOUND, featuring music composed by Carl Davis (THE FAR PAVILIONS, THE FRENCH LIEUTENANT’S WOMAN, KING DAVID) for the 1990 science fiction/horror film directed by Roger Corman, based on the novel by Brian Aldiss and starring John Hurt, Raul Julia, Bridget Fonda, Jason Patric, Michael Hutchence, Catherine Rabett and Nick Brimble as the Monster. Based on the novel written by Brian Aldiss, FRANKENSTEIN UNBOUND is a fascinating science fiction/horror hybrid story that begins in the future of 2031 and tells the story of scientist Joe Buchanan who, during the course of developing a new weapon system for the military accidentally causes Earth’s quantum integrity to unravel as electric storms and worm holes begin to appear all over the planet. Travelling home from work in his artificially intelligent car, Buchanan is sucked into one of the wormholes and finds himself transported back in time to 1800s Switzerland, where he begins to find himself a part of the real life events that inspired the creation of the classic horror tale FRANKENSTEIN, including witnessing the trial of Justine Moritz, meeting the author Mary Godwin (Fonda) herself, along with Lord Byron(Patric) and Percy Shelley (Hutchence) and finally encountering Victor Frankenstein (Julia), which leads to an encounter with the Monster (Brimble). With the knowledge of having read Mary Shelley’s novel, Buchanan tries to change the outcome of Justine Moritz’s trial and ultimately becomes a part of Frankenstein’s machinations after Victor discovers that Buchanan’s knowledge of electricity is far more sophisticated than his own. Repulsed by Frankenstein’s actions, he also recognizes his own hypocrisy in creating his own weapon system in the future that will ultimately end life on the planet. Taking action, Buchanan sabotages Frankenstein’s latest experiment and creates a new wormhole that launches them all into an unknown future for their final confrontation. Released in 1990, FRANKENSTEIN UNBOUND heralded the return of veteran producer Roger Corman to the task of directing a film. Well known for directing many great films in all genres in the late 1950s and well into the 1960s, including NOT OF THIS EARTH, BUCKET OF BLOOD, LITTLE SHOP OF HORRORS and many great adaptations of the stories of Edgar Allen Poe starring Vincent Price and Boris Karloff, not to mention launching the careers of many people in the industry, Corman stepped back from his directing duties to focus on producing films. 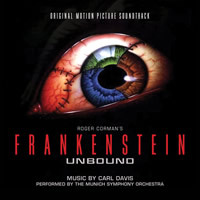 FRANKENSTEIN UNBOUND was a film with a modest budget and a very ambitious story and while the final film received mixed reviews at the time of its release, there is no question that one of the wisest decisions made during production was to hire composer Carl Davis to score the film. Performed by the Munich Symphony Orchestra, the score contains some of the composer’s best work, including one of his best main title themes. Carl Davis has made significant contributions to film and TV music, in the roles of composer, arranger and conductor. As an American living in Britain, he has found himself film and television work on both sides of the Atlantic. For television, he has done a number of historical dramas and big productions such as the HOLLYWOOD documentary series. For film, his score for THE FRENCH LIEUTENANT’S WOMAN is highly regarded. Davis also enjoys another career as a conductor. For a number of years he conducted the Royal Liverpool Philharmonic Orchestra during their summer season. He then went on to work with Paul McCartney on his "Liverpool Oratorio", orchestrating and conducting the music for the same orchestra. Davis frequently features as a guest conductor for other orchestras, and has for example conducted the Royal Scottish National Orchestra on more than one occasion. His most recent concerts with the RSNO have focused on Oscar-winning film music and songs. In addition to scores for contemporary films, he has also found a niche composing or reworking scores for silent movies. He did a little of this for the HOLLYWOOD series, and also scored PHANTOM OF THE OPERA for the Channel 4 Television series of silent classics, for which James Bernard recreated his uniquely dark Dracula sound for the silent NOSFERATU. Neither of these reworkings of silent movies were on the scale of Davis' mammoth reworking of Swiss-born classical composer Arthur Honegger's score for the epic five and a half hour film NAPOLEON. Davis' music for NAPOLEON was well received in France, where Davis was presented with an award for the score. Another project extending Davis' experience with silent films has been with the films of Charlie Chaplin. His feature film work includes CHAMPIONS, KING DAVID, THE RAINBOW and WIDOW’S PEAK. His work for television includes THE WORLD AT WAR, WUTHERING HEIGHTS, HOLLYWOOD, OPPENHEIMER, THE FAR PAVILIONS, THE PICKWICK PAPERS, COVINGTON CROSS, PRIDE AND PREJUDICE and CRANFORD. He has composed new music for many silent films including INTOLERANCE, GREED, THE PHANTOM OF THE OPERA, THE EAGLE, BEN-HUR: A TALE OF THE CHRIST, THE GENERAL, THE WIND and THE IRON MASK. BUYSOUNDTRAX Records brings FRANKENSTEIN UNBOUND to compact disc for the first time, with mastering by James Nelson at Digital Outland. The booklet includes liner notes by author Randall Larson, including insights from composer Carl Davis on this exciting large scale orchestral score. FRANKENSTEIN UNBOUND is a limited edition release of 1200 units. This title is expected to start shipping by 10/21/13.